First of all is the actual number of jobs. The BLS lists the number of anthropology jobs in 2010 as 6100, with a total of 7400 by 2020. If the job growth is gradual, with ~160 jobs being created each year, that’s still ~300 anthropology Ph.D.s out of work in their field each year for the foreseeable future. And this assumes that the normal number of retirements continue, providing for the regular entry-level jobs that account for ~100 academic jobs annually (which is about the number of jobs posted annually on the AAA job center). Second, when you look at where the jobs are projected to be, the BLS shows that most of the jobs will be in ‘professional, scientific and technical services’ (not education, but consulting), and that there will be shrinkage in jobs associated with ‘research and development in the humanities and social sciences’ on the order of 2.5%). The jobs associated with education (at all levels of higher ed — adjuncting and tenure track) only account for about 200 new jobs (if I read the table correctly). There’s also significant contraction in the number of jobs associated with the federal government (maybe related to human terrain work drying up?). Most of the growth that’s projected is in ‘scientific research and development services’ — which, I’m guessing, means a lot of contract archaeology. Which is pretty much what the BLS says: ‘Archeologists should have the best job prospects in cultural resource management (CRM) firms.’ But, they warn, ‘due to the large number of qualified graduates and relatively few positions available, jobseekers may face very strong competition.’ (But this, I’m going to guess, depends on growth in the U.S. housing market, where archaeologists will oversee holes being dug…) They also shore up my summary, saying ‘job opportunities for anthropologists will expand in businesses, consulting firms, and other non-traditional settings,’ but that these jobs are going to be very competitive. So, if that’s where the jobs will be, what can we do proactively to prepare for those employment possibilities? We should probably slow down the number of Ph.D.s programs grant each year. If there’s continued ~20% growth in Ph.D.s granted, the growth projected by the BLS will only keep pace with the number of new Ph.D.s. And unless job growth continues at the same rate, it will quickly be surpassed by Ph.D.s granted (although there must be a ceiling to the number granted, I’m just not sure what that might be — especially since there seem to be more and more new Ph.D. programs… — who doesn’t want teaching assistants?). I’m not sure how Ph.D.s might be limited in the future, but it seems that at the level of the AAA some kind of ‘best practices’ could be developed — which would both ensure a diversity of institutions granting Ph.D.s (so it’s not all elite institutions) and rewards actual success (programs that only graduate 5 students each year, but most of them are employed should be favored over programs that graduate 20 each year and only get 5 employed). But that’s a pretty farfetched possibility… More realistically, students might take to heart the success of programs when selecting where they’ll go, which might lead to the same results, i.e. unsuccessful programs will wither while more successful ones grow. More pragmatically, programs need to start training graduate students across the subfields to be able to do contract and consulting work, which requires a firm commitment to the professionalization of students that extends past preparing a pretty CV. Mixed field programs might find ways for graduate students across the subfields to develop collaborative projects, both as term projects, but also as dissertations. Historical archaeologists and cultural anthropologists share many concerns, and teaming graduate students up to conduct collaborative work would prepare them for a future of working on research teams in consulting situations. And cultural anthropologists might think about ways to participate in and contribute to biological fieldwork, with both living and dead populations — which training in science and technology studies might prepare students for. Preparing multi-author papers will help prepare students for the possibility of team-written reports. With contacts in local non-academic organizations, students might look towards the possibility of developing local projects (maybe alongside their dissertations) with organizations that already employ anthropologists (Rachel Wright has a nice piece about this in a recent Anthropology News). Whenever I teach our graduate methods class, I have my students volunteer at local organizations — a trick I learned from Penny Edgell at the University of Minnesota. It helps students get their fieldwork feet wet, can result in an early publication, and it also helps them get a sense of how their professional career might involve working in a non-academic setting. I’m sure there’s more to be done, but the low hanging fruit seems to be finding ways to prepare students for collaborative research possibilities (which cultural anthropology tends not to do, and that’s compounded by the meager funding opportunities that favor solo research) and to introduce them to non-academic employment possibilities. There must be more though — any ideas? 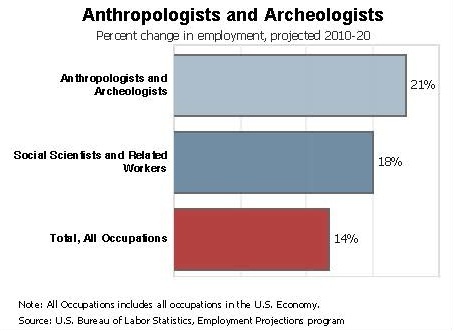 1-concerning the numbers, I’m wondering (have not looked at data tables to see if this is spelled out) if Anthropology jobs = jobs for anthropology PhDs or Anthropology Associates, BAs, MAs and PhDs. If it’s the latter, then we are even more royally screwed. Having looked at the tables a bit now, I think they are not all PhD jobs. 2-” (But this, I’m going to guess, depends on growth in the U.S. housing market, where archaeologists will oversee holes being dug…)” FYI, CRM jobs don’t have much to do with housing, unless you come across burials, which are protected. Archaeological work is required when federal money is spent, or work is done on federal land. This may also apply to some state projects. You don’t have to do survey ahead of time to dig a hole for a private home, but you do when you build a road (done that), pipeline (done that), cell tower, bridge (done that too). The other thing about CRM jobs is that unless you are hired full time, you are just a seasonal shovel bum with no benefits. (I’m sorry your leg is broken; you’re fired.) CRM work would be greatly helped if we did all that infrastructure spending people talk about. Reblogged this on Mind Over Matter.